The male had a black chest and tail feathers and a white belly. He is predominantly gray on the sides and back, with a large round rust-red head. The female is brownish except for her white belly and a white spot below the bill. Both male and female have a blue bill tipped with black and both exhibit broad gray wing-stripes when they fly. Lakes, ponds, marshlands, coastal waters and bays. Eurasia, North America, Madagascar, Australia and New Zealand. Major populations within the U.S. are: California, Arizona, and New Mexico. Also found in Texas, Colorado, Wyoming, Montana, North Dakota, South Dakota, Nebraska, Minnesota, Iowa, Missouri, Wisconsin, Atlanta, Maryland and Delaware. 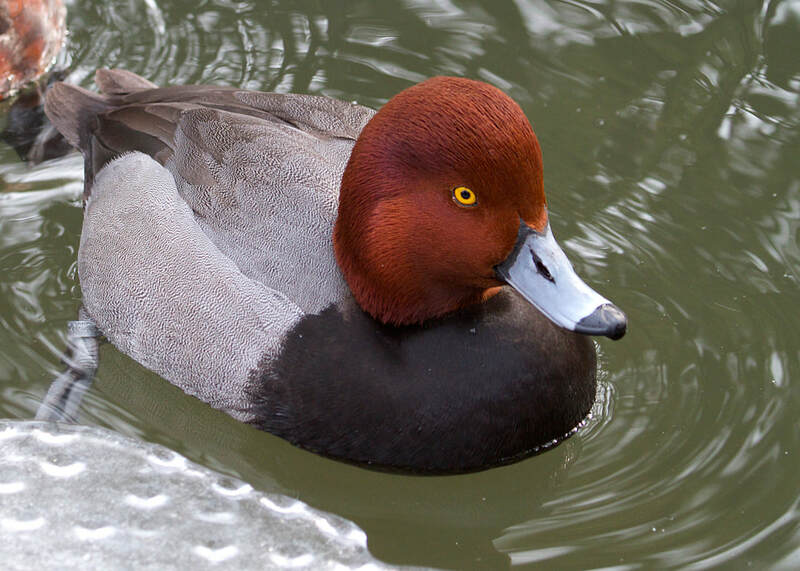 Canada, South Dakota, and western Montana have the highest breeding populations of Redhead. Ninety percent of their diet is plants, and the other ten percent is animals. Their diet consists of: pondweed seeds, tubers, leaves, musk grass, bulrush seeds, wild celery, duckweeds, water lily seeds, sedges, grasses, wild rice, widgeon grass, aquatic insects, mollusks, and small fish. They feed during the early and late hours of the day and are sometimes found feeding at night. They dive in water 1-3 meters deep to obtain food, but they can dive as deep as 14 meters. Approximately 9-15 eggs are laid in a down-lined nest. Incubation takes 23-29 days and is exclusively the female’s responsibility. The male drifts off after a few days of the female laying the eggs. Young fledglings fly about 9 weeks after hatching. 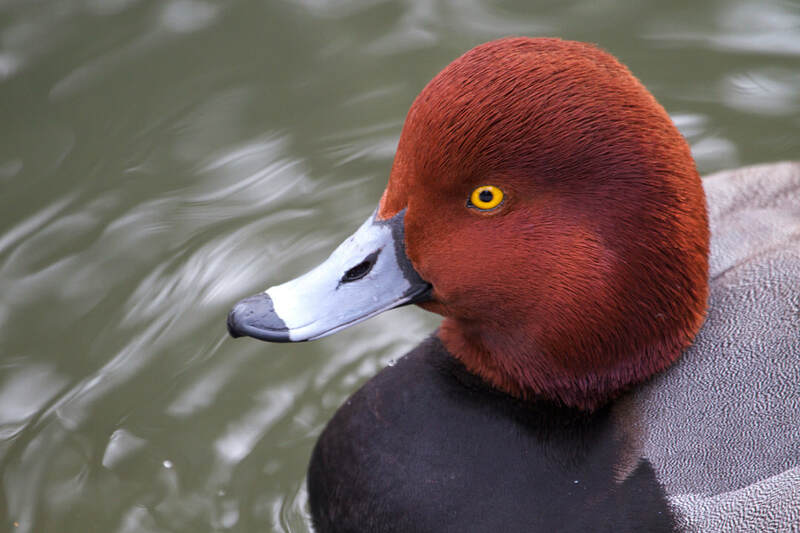 A substantial percentage of female Redheads do not nest; rather they “dump” their eggs in the nests of other Redheads or other species of ducks, especially Canvasbacks. There is documentation of dumping on at least 9 other duck species, and even nests of the American Bittern and Northern Harrier. Many parasitically laid eggs fail to hatch because the host female often deserts the nest and then renests elsewhere. The Redhead status in the wild is stable. You can see this interesting species of duck in our New England Farmyard. The males have a deep “meow” or “purr” when they call, while the females call with a typical “squawk” or “quack”. They are diving ducks with legs placed closer to the tail to aid in swimming underwater in search of aquatic plants and animals. Because they are heavy birds, they must run along the surface of the water when taking flight. They can fly between 31-55 miles per hour. Because of their build, they are somewhat awkward when walking on land.